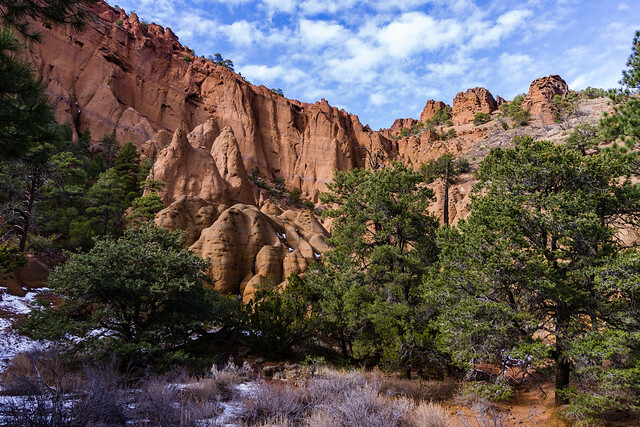 Red Mountain, located in the Coconino National Forest of northern Arizona, 25 miles northwest of Flagstaff, is a volcanic cinder cone that rises 1,000 feet above the surrounding landscape. It is unusual in having the shape of a "U," and in lacking the symmetrical shape of most cinder cones. In addition, a large natural amphitheater cuts into the cone's northeast flank. Erosional pillars called "hoodoos" decorate the amphitheater, and many dark mineral crystals erode out of its walls. Studies by U.S. Geological Survey (USGS) and Northern Arizona University scientists suggest that Red Mountain formed in eruptions about 740,000 years ago. The photo above shows the foot trail leading to the amphitheater of Red Mountain. Roughly the last half of the foot trail follows a normally dry stream bed. USGS Map: Ebert Mountain S.E. Location: 25 miles north of Flagstaff on paved highway. Access: Head northwest on Highway 180. This highway snakes through the central part of the San Francisco Volcanic Field on its way toward the Grand Canyon. About 25 miles from Flagstaff (at milepost 247 along the shoulder of the highway), turn left at a large Forest Service sign that announces the Red Mountain Geologic Area. Drive about a quarter mile on the dirt road to a parking space at the trailead. The walk from there to the base of Red Mountain takes about 30 minutes. Carry plenty of drinking water on a hot day (at least 1 liter of water per person). Trees in the natural amphitheater provide some shade. Click on map image for larger view. Note: There is a short, sturdy ladder near the end of the trail at the mountain to get hikers up an approximately 6 foot rise.